If you missed the first part of my Trans-Siberian journey, you can find it here. I arrived in Ulaanbaatar and was met on the platform by Doljmaa from the wonderful Sunpath hostel – a nice surprise considering I had emailed her incredibly late to arrange a pick-up and, having been without internet for over a day, was fully expecting to make my own way to the hostel. I was joined by a couple of other travellers who would also stay at the hostel: Chris – a fellow Englishman and teacher and a Frenchman called Max. As per usual, my plans were incredibly flexible. I had two nights booked in Ulaanbaatar, but it became clear fairly early on that the capital isn’t really an accurate representation of the country. In order to see the ‘real’ Mongolia, I’d have to venture out of UB somewhat. Thankfully Chris, Max and another guest at the hostel – Jon – all had similar ideas, and we booked ourselves a four night tour of Central Mongolia through the hostel. 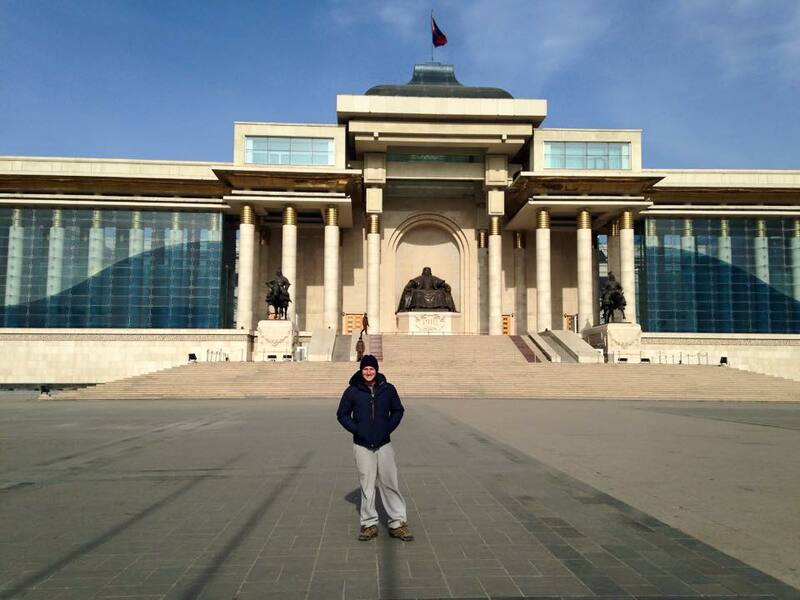 Sukhbaatar Square: one of the few things we saw in Ulaanbaatar! 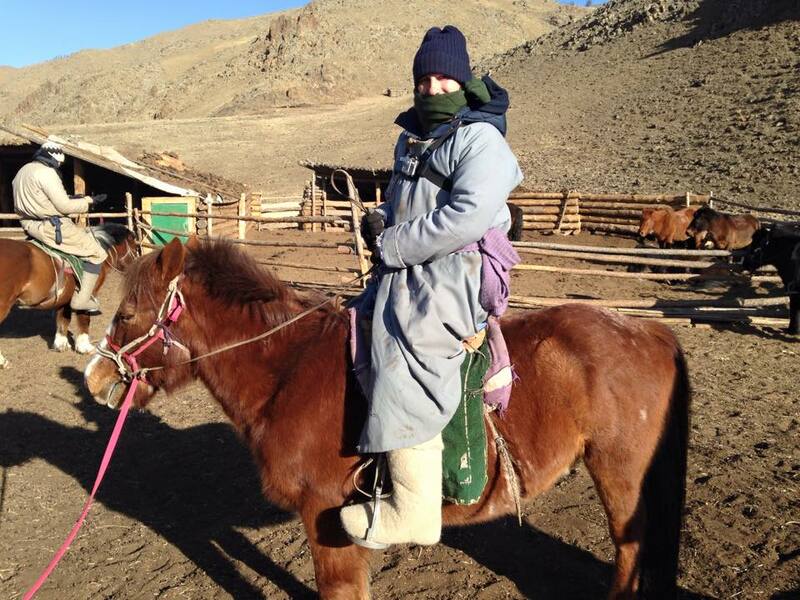 If, like me, your knowledge of Mongolia is very basic (and somewhat influenced by An Idiot Abroad) then let me say this: not many people ride horses and live in cool ‘gers’ in the city. I often think that you can’t get a feel for a country just by visiting the capital; it just wouldn’t have felt right to hop back on the train having only seen a big, busy, business-oriented city. The tour promised camel riding, horse riding and the opportunity to stay with real nomadic families in gers – now that’s more like what I pictured when I first thought about visiting Mongolia! As a side note: it’s incredibly easy to forget how big this country actually is. Given the fact that it is wedged directly in between Russia and China on a map, you could be forgiven for thinking Mongolia is actually quite small and I guess it is in comparison. Do not let this fool you though; it is bloody big. When you also take in to account that – according to our awesome guide Gala – around half of the three million strong population actually live in Ulaanbaatar, you can’t help but feel the country feels incredibly empty outside of the city. Our days on the tour would often involve six hour drives covering hundreds of kilometres, and we’d barely see another human face or indeed signs of life for what felt like hours on end. Occasionally, a couple of gers would appear on the horizon, blissfully pitched up on their own patch of land with nothing but scenery and a few (hundred, sometimes!) farm animals for company. Settlements such as these were our homes whilst on the tour. The first of which was in the ‘Semi-Gobi Desert’ where we arrived in the late afternoon and, after a lovely welcoming cup of tea, we were thrust on to the back of the family’s camels for a stroll through the desert: what an experience! The ride was one of the most chilled, peaceful experiences of my life. We all appeared to just be in awe of the surroundings and taking it all in. The ride was slow and a little bumpy, but Jon said that whilst we were out there it felt like you could just forget about everything and not have a worry in the world. I was inclined to agree. After the ride, it was time to kick back for the night. 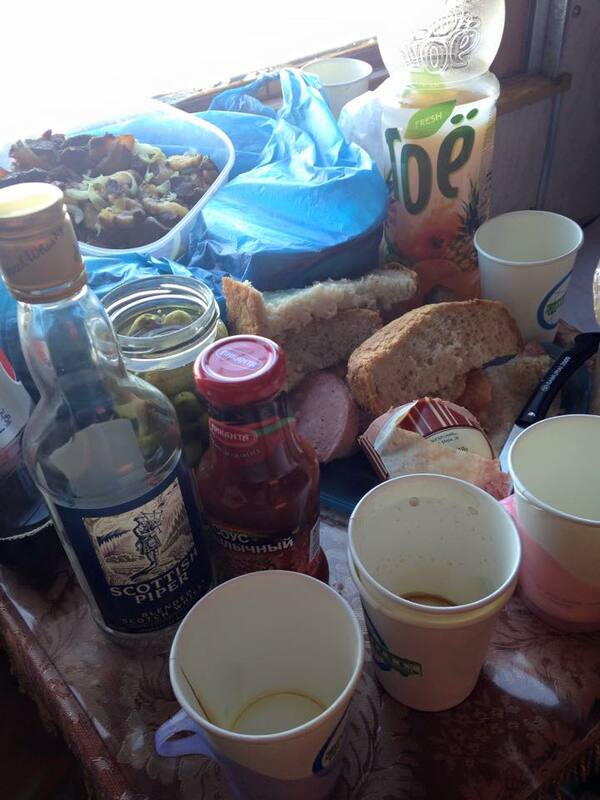 Talking of which – the first night in a ger was something of an experience. Firstly, I was very impressed with how well insulated they were. The heat from the fire was retained so well that, despite the temperature being well in to the minuses outside, I was getting a real sweat on inside. Bedtime rolled around and I was still sweating cobs; safe to say that the two sleeping bags seemed a little unnecessary right now. Regardless, I stripped down to my boxers (apparently sleeping naked isn’t good etiquette for a shared room) and wrapped myself up. I awoke bright and early. A little too early; 5am in fact. I was shattered and, more importantly, absolutely bloody freezing. The fire had gone out in the night and I suddenly saw why there was a need for a double helping of sleeping bags. I jumped out of bed and wrapped up with as many layers as possible but it was too late; I was wide awake and freezing my bits off! What followed were the slowest three hours of my life as I waited for the rest of the group to wake up. Once we were all awake and the feeling had returned to my vital limbs, it was time to hit the road again. Another six hour journey was on the cards today as we made our way further in to the countryside and to our home for the next two nights – via the Erdene Zuu Monastery in Mongolia’s ancient capital of Kharakhorum. Special mention to our hilarious driver Jara here as the route was largely off-road and, quite frankly, he did an great job of making the ride as smooth as possible. Not only that, but the fact that he remembers these routes when there’s no road or real landmarks to use as a marker is incredibly impressive. We arrived at our next home fairly late, so there wasn’t time for any activities. Instead, a rather tense game of chess between Max and one of the guys from our host family took place before we got the cards out and played a few games of ‘Shithead’ and ‘Presidents and Arseholes’ – such lovely sounding games, I’m sure you’ll agree. The following day was to be the highlight of the tour, as we got suited up in traditional Mongolian clothing and set off on a 14 kilometre round trip on horseback to a waterfall in the area. I’d describe my outfit for you, but I think I’ve said enough so far so I’ll just let the photo do the talking. As per usual, the picture says more than my words ever could. We hadn’t long set off when I came to the realisation that my horse (or pony, depending on who you ask) wasn’t the fastest of the bunch and was indeed the old man of the group. In fact, there were a number of occasions when the rest of the group had to wait around and wait for me and my trusty companion to catch up. I later discovered however, that when he got his gallop on he really stole the show. He was clearly just saving his energy; older and wiser! As you can see from the video below though, it wasn’t all plain sailing when he did pick up the pace. In fact, it was downright friggin’ painful. The weather actually picked up for this day, and a combination of this and our clothing made it the comfiest day in terms of climate on the whole tour. That said, I’m really glad we went at the time of year that we did, as the waterfall was frozen solid when we got there. Pretty amazing. Once again, I’ll let the video do the talking. This was to be the end of our organised activities, and we arrived back at the hostel a couple of days later after another night in the Semi-Gobi with a family who were distilling their own vodka; it’s purely coincidental that they were also my favourite family on the tour. After one final night and day in Ulaanbaatar, it was time to hit the road again. Next stop: Russia! My initial plan had been to go straight from Ulaanbaatar to Irkutsk; this would mean however, that the most impressive part of the journey round Lake Baikal would take place in the middle of the night. With this in mind, I decided to break the journey up with a night or two in Ulan Ude before getting a day train to Irkutsk. The hostel dropped me off at Ulaanbaatar station at around 7.30pm and I had just under an hour to kill. Unlike last time, I had enough cash on me to avoid the use of an ATM and I’d also stocked up on noodles, nuts, fruit and sweets before the journey so there was no real rush this time. That’s not to say that it was all easy though. Of course it wasn’t. The source of my stress this time was my inability to read cyrillic, which meant I had no real idea what platform my train was on. Thankfully, flashing my ticket about a bit (if you thought I was going somewhere else with that, you’re a sick individual) eventually got me to the right place in good time. I instantly noticed a difference from my last journey, in the sense that I most definitely didn’t have the compartment to myself this time. In fact, I wasn’t even sure I would have a bed, as my Mongolian roommate appeared to be carrying half of the city on the train with him which took up most of the room. His family kept bringing box upon box of stuff in to our compartment, which they seemingly decided would be their storage unit for the night. The more they brought, the louder my tuts and sighs got. How very British. We had a full house (of people, as well as luggage) by the time we left Ulaanbaatar, as a couple of Russian blokes also travelling to Ulan Ude joined us and we all bedded down for a fairly early night as we would be crossing the borders rather early. When I said early, I meant early. Now, I say crossing the borders fairly early but by that, I really mean hanging around for an eternity whilst immigration and customs do their thing. In fact, we arrived at the Mongolian border at 7am and didn’t leave the Russian one until 3pm; this is apparently par for the course. Before you ask – the long stop at the border was not related to my passport…for once. Thankfully, I befriended the two Russian guys (one of which acted as a translator for me and the other, as neither of us spoke a common language!) in my room and we killed the time by heading out to lunch at the border town and seeing off a fair bit of whisky. It did feel a little weird to be shotting whisky before I’d even eaten that day (and also having skipped dinner the previous evening), but it certainly helped us pass the time and slip in to alcohol-induced comas for a portion of the remainder of the journey! We arrived in Ulan Ude at around 9pm and it was, rather predictably, pitch black. My new friends insisted on dropping me at my hostel on their way home in a taxi; a nice gesture and one I was extremely grateful for, as the temperature was once again well in to the minuses and I had left my hat in Mongolia – it’s not easy being a slap head in these temperatures! 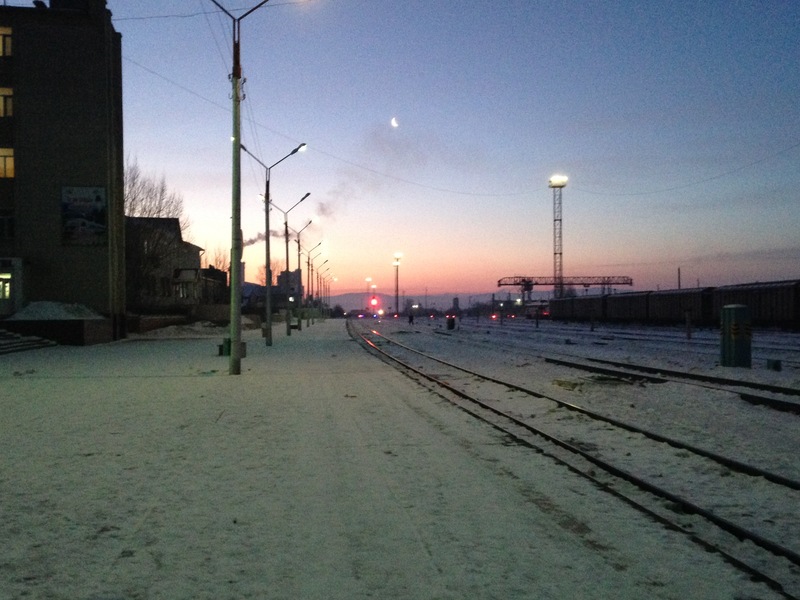 Click here for part three of my journey: Ulan-Ude to Irkutsk!